A few weeks ago the whole team attended the CAM Expo, which is one of the largest trade shows for complementary therapies in the UK. In addition to winning their prestigious Clinic of the Year award (shameless plug), we all had an opportunity to attend workshops with some of the most prominent people in the industry. This is one in a series of our biggest takeaways and how we’ll be using them to help you going forward. James Earls is one of the most groundbreaking therapists in the realm of fascia. His book ‘Fascial Release for Structural Balance’ is one of our ‘bibles’ when it comes to learning fascial techniques to help clients with their imbalances. When I heard he was giving a talk on fascia and functional movement, I knew I had to attend that workshop. If you’re one of my clients, you may already know that we always look at fascia (specifically, fascia around and connected to muscles) as well as muscles in a session. Mr Earls explained that fascia has elastic-like properties, so when you stretch a line of fascia, it has energy in it that can be used in movement. You can imagine a resistance band – when you stretch it, then let it go, it’s likely to snap back, no effort required on your part. Similarly, when you stretch out a line of fascia in your body, it has the capacity to ‘snap back’ a bit and assist your movement, meaning less muscle effort is required. We have these fascial lines throughout our body, and if we can learn to use them it can make movement easier – anything from walking to and from work to going out on training runs. If you have a shortness along a line of fascia that would usually be springing back to assist your movement, it may mean that one of your muscles in that movement is having to pick up the slack/work harder. This may mean that you end up having muscle tension, or symptoms related to muscle tension, that’s actually caused by a shortness somewhere else along that line. If we can assess where you may be short in a line of fascia and put you in a more optimal position, we may be able to make it easier for you to do that movement. Use less effort when moving? Sounds good to me! To give you an idea of how this would work, here’s an example Mr Earls used in the workshop. 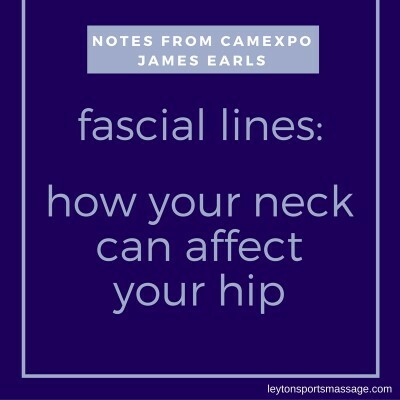 There’s a line of fascia that goes up the front of the body – from the front of your thighs, across your hip to your abdominal muscles, up the chest and up the front of the neck along the sternocleidomastoid (SCM). Assuming everything is in an ideal position, that line gets stretched every time you pull your leg behind your body (e.g. when walking). It holds potential energy, and when you stop pulling your leg back, that elasticity should allow your leg to spring forward with little help from your muscles. BUT if your head is in a forward position, that line becomes shortened and doesn’t have as much, if any, elastic spring-back. Without that ‘helper energy’ your front hip muscles have to do more work to bring your leg forward. Over time, this could lead to additional fatigue or shortness in the hip. And we all know what tight hips can cause… that’s right, lower back pain (among other things). That, my friend, is how your neck could cause hip pain. One of the things I love about this idea is how it really emphasises the interconnectedness of the body. We should always be assessing the whole body when we’re looking at any specific problem. This just gives us another potential theory to apply to your problem to hopefully get to your underlying cause faster. It also gives us another tool to increase our power in movements. check out the fascial lines on this guy! Have you ever wondered why football players pull their opposite arm up before a big kick? Why would they do that? Well, that’s another fascial line in the body – the functional line. You can see in this photo, he’s bringing his left arm back and his right foot back – he’s stretching the fascial rubber band from his right leg to left forearm. This gives him additional momentum when he then snaps forward to kick the ball. If you’re a runner, what fascial lines can you tension to give you greater momentum? Or table tennis player? or tennis player, for that matter? What fascial lines can you be taking advantage of to prevent injury or give you more power with less muscle effort? If you’d like to learn more about the lines of fascia and what function they perform, I recommend ‘Anatomy Trains’ by Tom Myers, or ‘Born to Walk’ by James Earls. If you’ve just read this and are thinking – ‘huh?? I really don’t get how my neck position makes it harder or easier to walk’ – I totally get it. If you’re anything like me, you’ll only really ‘get it’ when you feel it for yourself. At our monthly therapist meeting tomorrow I’ll be going through this with all our therapists, so from tomorrow, any one of us will be able to demonstrate the ways that fascia moves through our body and how it affects us functionally. We’d love to show you – just ask at your next session. Now, I’d love to hear from you – what movements would you like to be easier/take less effort on a day-to-day basis? Have you heard about fascial lines before, or is this new for you? Leave a comment below, or on our facebook page, and if you know anyone else who loves learning about the way our bodies work I’d be really grateful if you could share this article with them. Very interesting! The comment about using fascial lines in sports made me wonder how I could use this in swing dancing (I’m a relative beginner, but momentum & ‘springiness’ is often very important!). Food for thought!